J. K. Rowling before and after plastic surgery. After reaching a level of such high success, it appears the author has went from hogwarts to hollywood, presumably at the hand of a plastic surgeon. A quick examination would lead one to believe she had plastic surgery work done to her eyes (bags), nose (rhinoplasty) and perhaps some tightening of the cheeks thanks to botox injection. 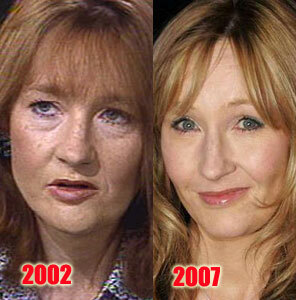 Its like playing a game of "name that plastic surgery", starring J. K. Rowling! "dreadful mythical goblin movies know only as Harry Potter..."
Really? Perhaps you should get your facts straight, OP. Harry Potter is a BOOK series about WIZARDS. They've also been heralded as one of the best book series written. While it's true that J.K.R. has clearly gotten a few jobs done, your credibility is quite smeared when you clearly don't know your facts before you post. She looks better after. Good for her. She was so homely before. I think she looks great. The article is about the suspected plastic surgery not about the books and/or movies. The OP doesn't need to know a damn thing about the Harry Potter series to write opinions on before and after pictures. The person who wrote the comments about J.K. Rowling should return to school for a grammar course. The "has went" is incorrect grammar (leave the "has" out of the sentence). After reaching a level of such high success, it appears the author has went from hogwarts to hollywood, presumably at the hand of a plastic surgeon.